I woke up around 5:30am. Had a quick shower and put on my race gear. I have to wait for Zaeidi to finish his shower and we went out of the hotel around 6:05am. My breakfast was only Powerbar Triple Threat and a bottle of 100plus. When we arrived at the transition area, not so many people had arrived. I arranged my gear nicely and neatly and at the same time looking around how the other triathlete organise their gear. After everything is done, it’s time for body marking. Luckily it was still early so the queue wasn’t that long. After that we went back to the hotel – one last ritual. To the toilet (membuang mana mana yang patut). The sea was calm but from far away we could see there was a black cloud heading to the shore. I guess its going to rain in the middle of the race. We did a few warm up and Zaeidi was still trying to overcome his fear of sea water going into his mouth. The race started 5 minutes earlier and we decided to start at the back. Let all of them go first, we don’t want to get punch and kick in the face. The swim was a 750m 2 loop swim. I was expecting my swim to be around 50 minutes but instead I managed to do it in 38mins. First loop I did 17 minutes and I was pretty much surprised. Lajunya masa ku. By the time I reached the bike rack, it was almost empty. So I quickly put on my bike shoes, helmet, gloves and my hydration bag. I managed to overtake a few cyclists while on the road. 10 minutes later on I have to stopped because my seat post clamp wasn’t tight enough so the seat post was slowly sinking down to the seat tube. So kana sayur lah. Zaeidi managed to catch up and overtake me at the first uphill climb (tarmac road) and after that he was nowhere to be seen. To me , the off-road trail wasn’t too technical. I managed to climb all uphill and managed to sayur a few people while climbing up. peanut lah. I guess comparing to this trail with McFarm and Hutan Simpan Berakas. This was much easier.The downhill, susah lagi Hutan Simpan Berakas. The difficult part was when it rain, it becomes muddy causing some of the downhill un ride-able. I managed to fall a few times because it was too slippery and due to my wheels was fully covered with mud. Advisable use a disc brake instead of V-brake. I guess those who are infront, managed to miss the rain during the off road trail, that's why I saw some of their bikes wasn’t that really dirty compared to mine. The end of the bike ride was the beach trail and it was really challenging. At one point we have to carry our bike down the big stone because there was no way it could be ride-able. One ‘mat salleh’ just throw his bike from the big stone to the beach. No respect and love for the bike. A few hundred meters after the big stone, I was still pedaling my bike along the beach, where I suddenly felt my thigh cramping up. So I increased my cadence but still it didn’t do any good. So I stop, mount off, let go of my bike and fall down like a tree. So there I was lying down the beach, the sea water was hitting me, luckily I wasn’t carried away by the water. I had a cramped on both of my thigh and cannot bent it. It was painful. Those who pass by me didn’t do anything, they just ask me what has happen and head on. I don’t blame them for not helping, they are in a competitive mode not in a helping mode. So after a few minutes, as painful as it gets, I bent my leg one by one and slowly I recovered. I was glad that I can continue the race. At one time, while I was ‘sunbathing’ at the beach hurting due to the cramping, there was this one Chinese triathlete come up to me instead of asking how I was doing, he was telling me not let my mountain bike to be washed up by the sea water. Its salty and it can damaged my mountain bike (as if I don’t know). ‘bodoh punya orang’. My legs is more important than my bike. I can easily replace my bike but my legs ada jual kadai supermarket kah? lagi sekali….BODOH PUNYA ORANG!!!! Next time if I have a cramped, I just first put my bike somewhere safe, maybe under the tree far away from the salt water and then baru cramp. Lastly…….VERY STUPID REMARKS. I started my run with my thigh muscles still hurting. I looked at the time and I still have plenty of time to finished the race. It was a 10km trail running divided into 2 laps. The first lap was mostly recovery walk and a few run here and there. I was mostly making friends and talking to ease the pain. End of first lap, we have to cross a small stream waist deep and I heard some of the athlete complaint about it. This is Xterra and trail running not road running. I guess those athlete are ‘Freshie’ or ‘Newbie’ to trail running or hashing. This is nothing compared to trail running in Biathlon Bakam Challenge in Miri or hash run. The last lap, I’ve decided to run and tried to improve my time so that it won’ be that that bad. I’ve managed to finish my run in a time of 1:15:33. Overall my total time was 4:39:41 (5 hours was the time limit) even though in the pictures it say 4:43:39. I was happy with my achievement eventhough I was beaten (sayur’ed) by Zaeidi and Zulhassan. You cannot win them all. The biggest improvement was my swimming time. I guess my swimming technique has improved a lot and maybe the sea condition was perfect to score a good swim. For sure I’ll come back again maybe in 2011 or 2012. 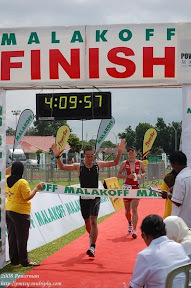 Next project is Ironman 70.3 Putrajaya Malaysia to be held on Sunday, 26th July 2009 and I’ve successfully convinced or in Zulhassan dictionary – racun Zaeidi to participate in the event also. Cool eh. I was wondering kenapa kau lambat sikit yo rupanya sasat. Most important thing experienced atu and finished the race. see you in 70.3. I will not be taking part, but will be supporting friends that had supported me in my IM races. Stupe: hopefully I'll see you there. I've link your blog. kalau tak sesat... sayurlah aku. swim time ko baguslah. Harap lebih yakin untuk next race.